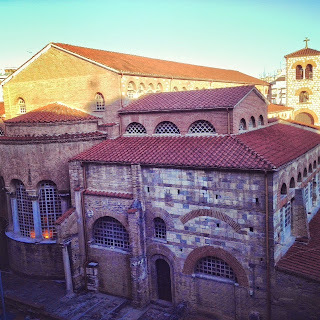 This is the view from our window in Thessaloniki: the 1700 year old church of St. Demetrios. 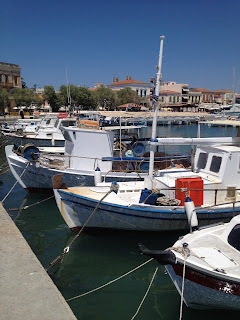 I awoke at 7:30am to the church bells announcing the beginning of Orthros (morning prayers). I got ready and went downstairs and across the street to church by 8:00 for the last part of Orthros. 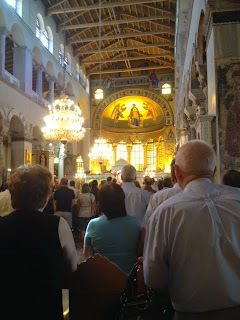 The Great Doxology and bells at St. Demetrios Thessaloniki, Sunday 13 July 2014. 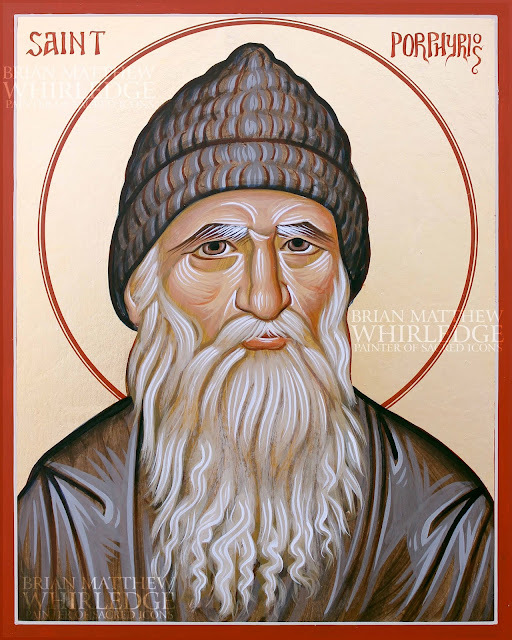 It was a pleasant surprise when a fully vested bishop emerge from the sanctuary: this meant this morning would be the much more ceremonious Hierarchical Divine Liturgy. At least half a dozen priests and a dozen subdeacons and servers made lengthy processions the entire length of the five aisled basilica. Hundreds and hundreds of faithful prayed. The house was packed with standing room only. This church houses the relics of St. Demetrios and the nun martyr St. Anysia, his contemporary. 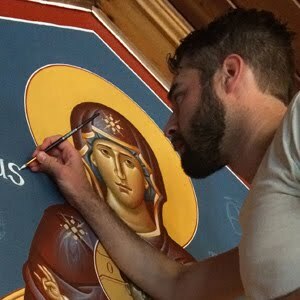 St. Demetrios was a well known, high ranking official in the Roman army whose outspoken Christian beliefs drew the ire of the emperor Maximian. The emperor was killing Christians in gladiatorial contests with his invincible vandal champion Lyaios. Nestor, an untrained disciple of St. Demetrios, defeated the mighty Lyaios. The crowd erupted in chant "Great is the God of Demetrios!" 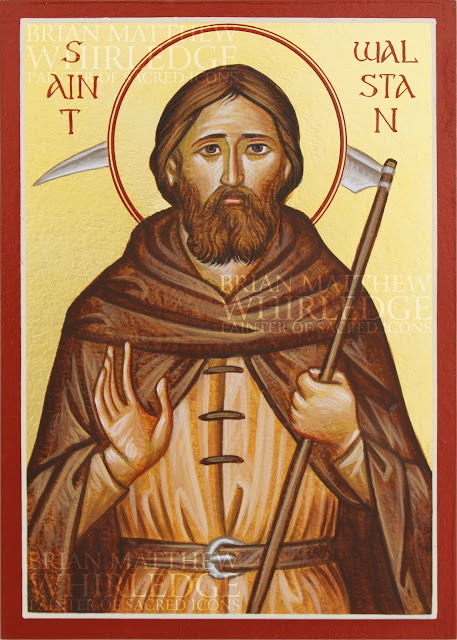 St. Nestor was then beheaded and St. Demetrios was martyred with a lance on 26 October 304. The church was built over the site of ancient Roman baths where St. Demetrios was imprisoned, martyred and buried, near the site of the arena, the ruins of which are still visible a block to the south.